Brace for Impact. Juno hits NYC and our mayor is ready! Mayor De Blasio overseeing the tunnels and bridge closures riding a Tauntaun a la Han Solo in Empire Strikes Back. Please stay inside, until we say it's safe! Featured on Gothamist.com during coverage of Juno. Way to keep the roads clean! Thanks guys! Let's make the most of the snow day, and play in central park! Are you an editor of an online publication? Do you need some dope animated gifs to help tell your story! Reach out and contact a JaegerSloan near you. Halloween Costumes – The Moon, Doug Jaeger, and The Sun, Kristin Sloan. 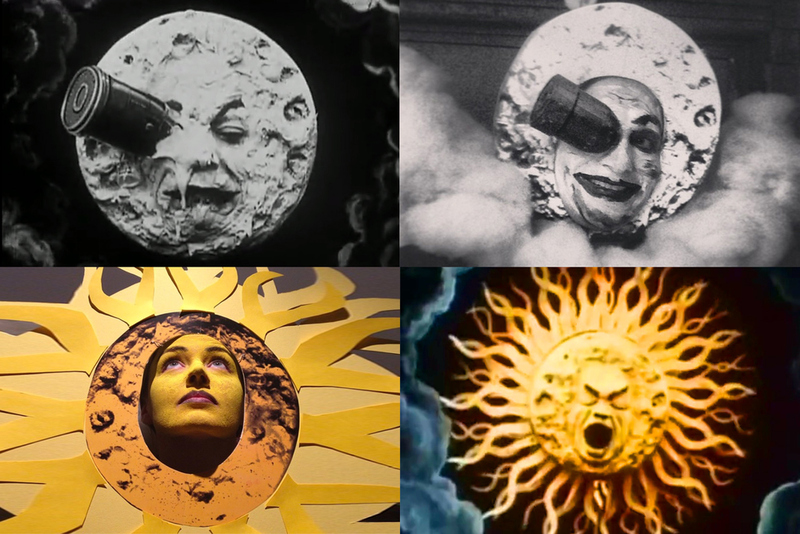 For halloween 2013 we got inspired by Georges Méliès, who was a French illusionist and filmmaker famous for leading many technical and narrative developments in the earliest days of cinema. He is most famous for his film A Trip to the Moon from 1902 and the Impossible Voyage from 1904. So for costumes we decide to go as the Sun and the Moon. We used cotton stuffing from pillows and some wire to make cloud structures on our shoulders, with print outs spray mounted to foam core, complete with face make-up and a 3d printed rocket that was attached to my eye. Zoe Keating at Sub Culture. Last night we were lucky enough to attend one of Zoe Keatings 3 sold out performances at the newly minted venue, SubCulture in NoHo. We licensed some of her beautiful and dynamic music for the work we did with The Clark. We were invited to share some of our work this week at 19 Kenmare. This Wednesday November 2, 2011 from 6 till 9 at Dell's pop up experience, CREATE, WORK INSPIRE. Presentation will start at 6:30. We’ll start by sharing our short piece entitled “One Minute High Line”. A screening and discussion of our process creating a time-lapse film of the High Line, for the architecture firm Diller Scofidio + Renfro. The film is currently being shown as part of an exhibition featuring Diller Scofidio + Renfro’s work at the Gwangju Design Biennale in South Korea. The Design of Fame film featuring former ADC President George Lois played in front of the design community at the ADC's Hall of Fame Gala. It was amazing to sit next to George Lois and across from Massimo Vignelli.